*Presentation files & various resource books (Including ‘Common Core: Korea’) for all the participants! “The Korean War and its impact on Today's East Asia"
By Dr.Bruce Cumings Gustavus F. and Ann M. Swift Distinguished Service Professor in History and the College at University of Chicago. He explores modern Korean history, 20th-century international history, U.S.-East Asian relations, East Asian political economy, and American foreign relations. He is the author of The Origins of the Korean War (Princeton University Press, two volumes, 1981, 1990); War and Television (Verso Books, 1993); Korea’s Place in the Sun: A Modern History (W. W. Norton, 1997); Parallax Visions: Making Sense of American-East Asian Relations (Duke University Press, 1999); North Korea: Another Country (The New Press, 2004); co-author, Inventing the Axis of Evil (The New Press, 2005); Dominion From Sea to Sea: Pacific Ascendancy and American Power (Yale University Press, 2009); and The Korean War (Random House Modern Library, 2010). He is also working on a synoptic single-volume edition of his Origins of the Korean War, and other projects. By Dr. Jinsoo An, Assistant Professor at U.C.Berkeley. He received his M.A. and Ph.D. from the Dept. of Film and Television at UCLA with his dissertation on post-war Korean cinema and national identity. He continued his research on Korean cinema and culture at the Dept. of East Asian Studies of NYU (2004-2006) as a post-doctoral fellow and lecturer and taught at the School of Design and Media of Hongik University (2006-2010) in Korea before moving to Berkeley. He has written on topics related to Korean cinema including representation of Christianity, nationalism, historical drama, popular justice and legal formalism and cult film aesthetics. His current project focuses on representation of the colonial past as knowledge production and cultural imagining in South Korean cinema. By Dr. Dafna Zur assistant professor at Stanford University. She teaches courses on Korean literature, popular culture, visual culture, and Asian children’s literature in the department of East Asian Languages and Cultures. Zur's current book manuscript traces the development of the idea of the child and young reader in magazines. She draws on the texts and images from those magazines to arrive at an understanding of the imagined role of the child in the cultural imagination of colonial and post-liberation Korea. She also works on North Korean materials, and has written several articles on the Korean War in North and South Korean children's books. Her interests lie broadly with the children's literature of South and North Korea, folk tales, and translation. Dafna Zur received her PhD and MA in Asian Studies from the University of British Columbia, and a BA from Hebrew University of Jerusalem. By John R. Stevens, Lieutenant Colonel, USMC (Ret. ), Secretary of the Korean War Memorial Foundation in SF, He served in the Korean War during the Pusan, Inchon-Seoul, and Chosin Reservoir campaigns. He was awarded two Bronze Stars with Combat Vs. After retiring from the Marine Corps, John launched and operated several computer/communications companies. He is the Past President of the 1st Marine Division Scholarship Fund, and serves on several non-profit boards. John has donated $50,000 to the Foundation. By Maurice Rickman, Lt. Commander, United States Navy. He was a navy pilot during the war. Was on the cruise during the winter of 1951-1952. He flew air born early warning radar aircraft. Never bombed Korea but took part in combat as guarding the ships. 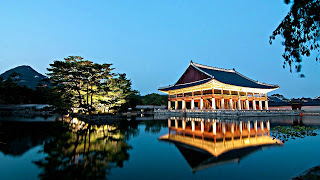 (http://tinyurl.com/2015seminar-Korea) Limited to the first 30 registrations. 2) After registering online, submit your deposit payment.